Recent major disasters in the Americas—including Hurricane Mitch, the landslide in Venezuela, the earthquakes in El Salvador, Hurricane Isidore, the Peruvian earthquake and others—have yielded valuable lessons regarding damage to health facilities and solutions to lessen the impact on critical infrastructure. This experience, coupled with the conclusions of the regional meeting on hospital disaster mitigation held in 1996, points to the need to examine more closely three main topic areas: disaster mitigation, hospital evacuation and the use of foreign field hospitals. 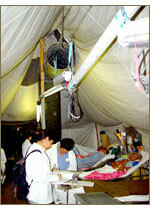 Approximately 50% of the 15,000 hospitals in Latin America and the Caribbean are located in high-risk areas. In the last 20 years, more than 100 hospitals and at least 1,000 health care centers in this region were damaged as a consequence of natural disasters. The direct cost of these disasters has been enormous, not only were health services lost (including the interruption of urgently needed health services), but in some cases the collapse of hospitals caused the death of occupants. In this context, existing regulations concerning the design and construction of health facilities must be revised and enforced, reorienting them toward disaster mitigation, with the ultimate goal of protecting the lives of patients, staff and other occupants and ensuring that these facilities can continue to function during and after a disaster strikes. The knowledge on how to build safe hospitals exists and is accessible. At some point during an emergency or disaster, it may be necessary to evacuate hospitals. But unnecessary evacuation can lead to serious problems, including the reintegration of a health facility into the health services network, which could take several months. The topic of when to evacuate a hospital will be discussed. The meeting was held in San Salvador, El Salvador from 8 -10 July 2003. PAHO/WHO also acknowledges the financial support of the Canadian International Development Agency (CIDA/IHA); the Department for International Development of the U.K. (DFID/CHAD); and the Office of U.S Foreign Disaster Assistance (OFDA/USAID).